Amy does a great job telling about her project, "I've made this one-sentence journal as a part of my 2012 Happiness Project. 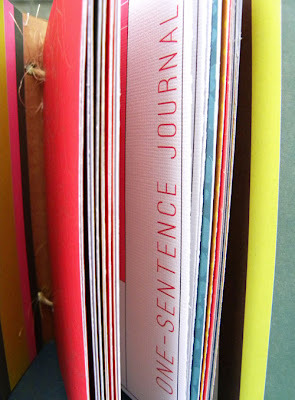 I think that the 'One-Sentence Journal' can be just as therapeutic as a regular journal but not quite as time consuming so its a good fit for me :)"
"To make my journal I used corrugated cardboard as the base and covered it with my very favorite piece of foiled paper from the Sunny Day Paper Pack. I left the spine unaltered for a fun upcycled look. The stitching around the edges of the cover helps to secure my papers to the cardboard base while adding a nice finishing touch. 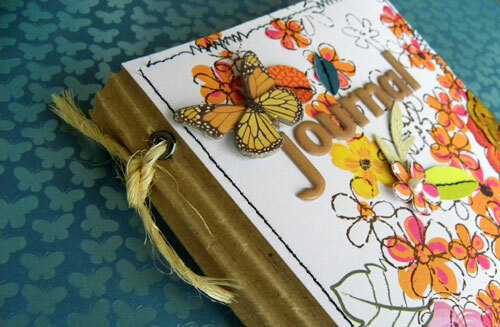 I added the word 'journal' to the front using the Chocolate Milk Puff Alphas and then accented the cover with a sprinkle of leaves and flowers to add some dimension. Finally I used the back side a metal charm from the Moonrise Filigree pack to make the 'keyhole' inspired accent to finish off my cover--I loved the way the tarnished gold finish looked with the foiling on the paper." 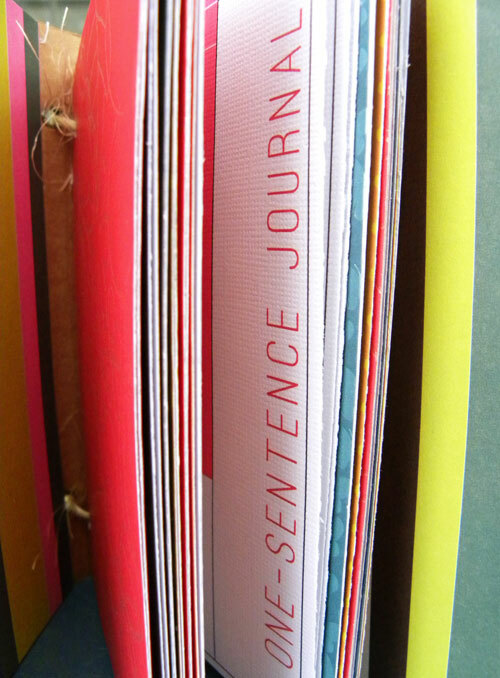 "I brought some more of the of the fun patterns from this paper collection into my journal by finishing the insides of the cover with a coordinating striped paper and using them to make my monthly dividers." 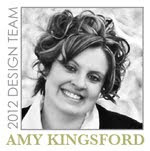 "My journal pages are made with a customizable template which is available as a free download at Karenika.com. 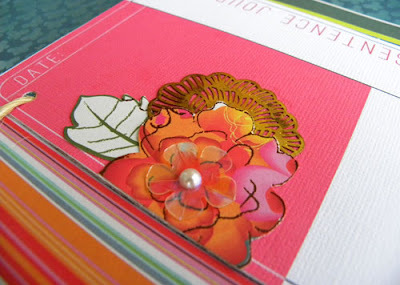 What I love most about these pages is that they have a fun colored block that can be used to clip a photo to in Photoshop--or I've chosen to print them out without a photo and add a little bit of art to this area each day with the leftovers on my scrap table." 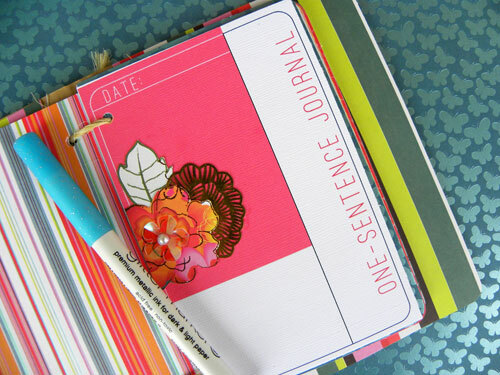 "To bind my journal I set eyelets in my spine and punched holes that corresponded into all of my pages and dividers. Then I used just to tie them all together. Again this adds to the upcycled feel of the journal and provides a way to hold everything together as well!" 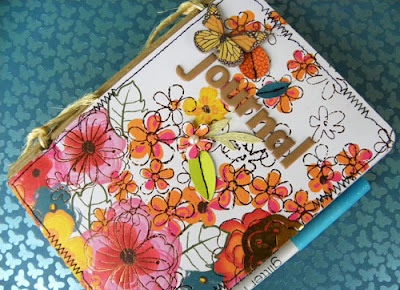 "I'm so excited for 2012 so that I can use my journal to do a little bit of creating and reflecting each day!" what a GREAT idea of one sentence to journal about what you are grateful for!